Parents love to hear the words, "Kids Eat Free," because eating out can often be a trial in patience and budgeting. First you have to successfully round up the kids to leave the house, then comes the cheque which can make you contemplate taking out a second mortgage. Ok, maybe that's a tad dramatic, but the bill can certainly add up fast! Luckily, these kid-friendly promotions can take some of the stress out of dining out, leaving you with plain, old-fashioned, quality family-time. Here is a list of Canadian restaurants that love kids and who want to make dining out FUN. FYI - Promotions can change without notice and also vary by location, so please call ahead to avoid any disappointment. Also be aware that you cannot usually combine these "kids eat free" promotions with other coupons or deals. Crabby Joes: Kids, 12 years and under, eat free on Sundays at participating restaurants. Hooters: Kids 10 years and under eat free from the kids menu on weekends, with the purchase of an adult entree pried at $12 or greater. Valid at participating restaurants. Denny’s: Kids eat for free on Tuesdays from 4p.m. to 10 p.m. 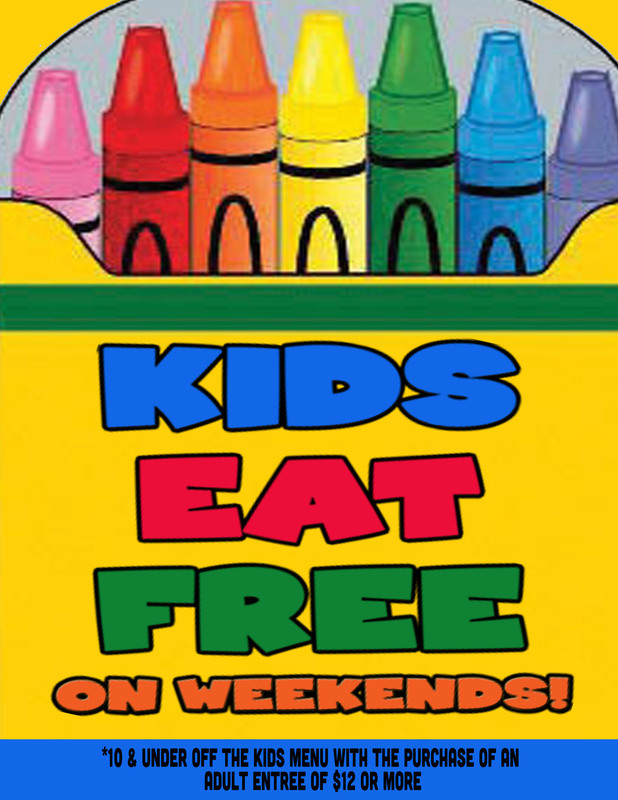 There is a limit of two free kids' entrees with the purchase of one regular priced adult entree. Dine in only and valid at participating locations. Montana’s BBQ & Bar: Kids under 12 years-old eat free every Tuesday at participating Montana’s restaurants and if they join the Kids Birthday Club then they also get a free meal and fun activities. Pizza Delight: Every Tuesday, kids 10 years-old and under eat for free, when they dine-in. Meals off the kids menu also include a free drink and dessert. The offer is not valid in Cavendish PEI. Pizza Hut: Kids eat free on Tuesdays from 4p.m. at participating restaurants, when an adult purchases a meal. Applebee's: Kids eat for $1.99 every Wednesday from the kids menu when an adult orders a full-priced adult entree. The kids meal includes a free drink and dessert. IHOP Canada: Kids under 12 years-old get one free kids entree on Thursdays from 4p.m.-10p.m. with the purchase of an adult entree. Drinks for kids are $1.79. Humpty’s: Kids 10 years-old and younger eat free every Friday between 5 – 9 pm, at all locations, with the purchase of an adult meal priced from $6.95. Boston Pizza: Kids meals are priced at $7.99 and come with a free activity and pack and treat-your-own sundae. If you purchased a Boston Pizza Foundation Kids Cards before October 1, 2017, you can still use your kids meals until June 30, 2018 and also register it to your My BP loyalty program card. Check the Boston Pizza website for further details. Chicken Chef: All kids receive a free drink and dessert when they order off the kids menu at participating restaurants. Simply select your location to browse the menu. Cora: Cora's kids under 12 years-old can order off the kids menu comes and receive an free Cora orange juice, milk, chocolate milk, bottled juice or fruit drink. East Side Marios: When kids join the Mini Mario Club, they get free special Mini Mario news, promos and deals, including five free Kids Eat Big meals and five free Chillers, after they register for their VIP membership. Also, with he purchase of a Mini Marios menu item, kids receive a free drink, dessert, activity book, crayons and custom toy. Ikea Canada: Currently, Ikea offers free baby food for every adult meal purchased in the IKEA restaurant. Promotions do change throughout the year, so be sure to check their website for current deals. Jungle Jims: Kids 10 years-old and younger can eat from the kids menu that includes a free drink and dessert. Plus, on Tuesdays from 4p.m. Safari Kids pay only 0.10 cents for every centimetre tall they are, when they order off the kids menu. One kid per adult. Moxie's: Kids under 12 years-old enjoy unlimited drinks and desserts when they order off the kids’ menu. Perkins: When kids order off the Kid Perk Menu, each entrée comes with one free side, drink and a treat. Add another side for an additional charge. Smitty's: Kids 10 years-old and younger can order breakfast, lunch or dinner off of the kids menu and receive a free kid-sized drink and cookies. Swiss Chalet: Kids 10 years-old and under eat for free on their birthday, when they order from the kids menu. Not their birthday? Kids entrees starts at $6.99 and come with a drink, side and dessert. The Keg: The Kids Menu comes with a free vegetable plate, ice cream and a soft drink, juice or milk. We haven't been able to find any Monday promotions in Canada yet, but we'll let you know if we come across one or two! If you want more restaurant deals and promotions, be sure to check out our coupon page. Happy dining and do let us know if you hear of any other restaurants offering a "Kids Eat For Free" promotion. At Wacky's Wings, kids under 12 eat free when eating with an adult on Sundays. Mongo's Grill has Kids Eat Free on Tuesdays (4pm - 9pm) for kids 10 and under with the purchase of a regular stir-fry.